Molly: There was resistance from the youth services manager years ago when we first began our book club because they thought it wouldn’t be a program that teens would attend. If it hadn’t been for a a core group of regular teen patrons who were lobbying for one, we never would have started. It’s been going for 5 years now, and this group will be seniors next year. While others have attended a few meetings over the years, it’s mostly been the original group. I think these book clubs (like many programs) will be most successful when they are teen driven and something that they want. There’s no reason to feel like you have to have a book club if it’s not the most valuable program for the teens you serve. Dawn: I choose our books. I read all the books before I choose them to see if they are discussion worthy. My teens tend to like realistic fiction above anything else so most are realistic fiction but I will break it up with a light fantasy. I’ll also choose a graphic novel in September (back to school grind) and January (around finals time). Sarah: Since my school is a college preparatory school, students have plenty of work so I didn’t feel I should “assign” anything. Also, since we only meet monthly, it wouldn’t work for a group assignment since some of these kids read a book a week. Also, I don’t have a collection large enough to have 15 copies of the same book. Instead, we do a book talk type of book club. Everyone goes around the room and talks about a book they have enjoyed, are reading, or even one they didn’t enjoy. Jennifer: I pre-read the titles and sometimes base my selection on what is available in our system (or what I can afford to order more copies of). It has been fairly sci-fi/ fantasy heavy this year because I take the interests/suggestions of the group into account. Last year they asked that we read at least one “classic” title a year, and so far we have read Call of the Wild, and we will be reading Ender’s Game over the summer. Their takes on older YA titles are always interesting! Susan: The structure of the club varied. I know for Holes, we did some activities, for Charlie Brown books, they did some impromptu skits. We did Teen Book Jeopardy (manually) – came up with the books, questions, etc. before scheduling a night to play the games. Teens took banned books and wrote a blurb on each book as to why the book was banned, and we have a “date with a book” event. Traci: I also choose all of our books. At first, they were choosing their own, but they would only choose books/genres they liked; they were never really expanding their horizons or trying things they weren’t sure about. Eventually, the older teens moved on, and my younger teens asked me to start choosing the books. “That’s your job, right?” they would always say with a smile. We are still following that method today. I try to choose a good assortment of all different genres as well as books off the Printz list and Best Books for Teens list. We also always watch the movie adaptation of a book for our December book group. Diana: Originally, the teens selected the books at the end of each year, but myself and the other library staff found that the teens that chose the books for the coming year didn’t attend. So, I began choosing the books on different parameters based on their feedback: varying genres (something for everyone), short enough to read within a month (since they do a lot of reading for school work), and something that could inspire conversation and/or activities. Emily: Every three months I prepare a list of twenty books and their summaries. I usually pick based on reviews and awards as well as books that teens in the library have recommended to me. The teens pick their top three choices from the list and the books with the most votes are our books for the next three months. Molly: When we first started, I choose the book after taking several suggestions from the teens. My goal was to rotate genres so that we were reading a widely. Most books were chosen off of the Best Fiction for Young Adults or other YALSA award list. After discussing books for several years, I’ve come to find out that there are certain books that make for better discussions—books that are concept driven or have interesting or unique stylistic elements give readers a lot to talk about. Dawn: As of now, we have a budget so that the teens can keep their books. We have about 10 teens. I get them from Baker and Taylor so I can get the discount. Sarah: The kids either talk about their own copies or library books they’ve checked out. Traci: I have a budget for my Teen Book Group that provides money for food and books. I buy 10 books each month (the usual number of teens who sign up). If we are out of books, teens are encouraged to check the book out of the collection; teens who own their own copy of the book are also welcome to attend. They have to return the books each month so I can make a “Book Set Kit” out of the books for the YA collection. I buy the books from Ingram’s so I can get the discount. Diana: We use library copies of the books (I put requests for them from our other locations so that there are some available to check out at each meeting). We will be going from a book-specific teen book club to a monthly genre feature, so this should make finding books for everyone easier. I also provide snacks using the library programming budget (which I have to request in advance). Emily: We have a small collection development budget so we have to interlibrary loan our books. This limits us to backlist titles, but every December they pick one new release that I purchase for them to keep. Club members (myself included) are encouraged to bring a snack to share. Molly: My library circulates Book Club in a Bag kits, with 12 copies of a book. 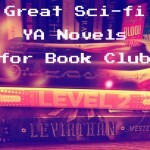 I select the titles for our teen club and our YA for Grownups book club, and then they become part of that collection. 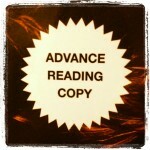 To control costs our selections must be available in paperback. Currently, my book club is a YALSA’s Teens’ Top Ten nominating club, so we are reading the ARCs that we’re sent as part of the program. How would you describe the structure of your book club? Do you rely on discussion questions or activities? Dawn: We meet at Culver’s for one hour. We let them socialize for 10 minutes. The discussion lasts about 30 minutes. We end with special announcements, pictures to tweet, and/or a special activity. The activity varies. For December, we are playing White Elephants with books. Sometimes we have very special events. For example, we discussed Paper Towns and went to see the movie the following day. Sometimes we invite a local author. Next month we’ll go bowling. Sometimes we’ll hop on the train to go to an author visit at a local bookstore. Our club is mostly discussion based. Sarah: Crazy, fast, and exciting! We meet 30 minutes after school so everyone has to try and book talk their book in a few minutes. Sometimes if we have about 5 minutes left, we’ll do a “lightning round” where they have to talk about a book in only a few sentences. It’s more of a discussion of what they are reading on their own and suggesting it to others. Also, our author visits and writing workshops occur during the school days for the whole grades so I sometimes showcase who is coming to the school. Jennifer: Ours in the public library after school. I come prepared with questions about plot points/characters, or a specific idea that I want to get their opinions on, but I try not to get attached to any ideas because the meetings usually dissolve into discussions that have nothing to do with the book. Occasionally I will branch out to a craft, but I try to keep these projects as process driven as possible. My favorite activity/book pairing was when we read Cardboard by Doug TenNapel and then got to make cardboard self portraits. Traci: We meet on the last Thursday of each month for 1 hour from 4-5pm. Before they get snacks, they have to write at least 1 discussion questions. The discussion questions written by the teens are what drive our discussion. Usually, I also move the discussion along with my “Table Topics” set of questions for book groups. We also start out the group by going around the table & introducing ourselves as well as answering a special question of the month. Sometimes I come up with that fun question and sometimes my teens do. We usually talk for about 45 minutes, and then we talk about school, draw on the white board or talk about other books for the remaining 10-15 minutes. Diana: When I originally took over the book club from a previous teen librarian, we had done discussion questions. However, we found that since not all the teens finished the book or we had new members of the club, it was more difficult to keep up a conversation. Thus, for our new book club starting in spring, we are focusing on a genre and will be book-talking materials in that genre (both teens and librarian). A snack portion was not part of the original club, but will be going forward in order to entice after-school teens. The program is held after school at the library in one of our program rooms. The hope is to add topical activities, as well. For example, January will be highlighting graphic novels and we will be talking about how to create a storyboard. Emily: Very free-form and relaxed. I usually have discussion questions prepared in advance in case the conversation lags, but it seldom does. Sometimes we go off on tangents and that’s ok. We have a book club notebook that we pass around every meeting so that if they have opinions they don’t feel comfortable voicing they have a place to share them. If we are reading a book that touches on a difficult topic such as Just Listen by Sarah Dessen or It’s Kind of a Funny Story by Ned Vizinni I will make them packets of information (such as helpful websites and hotline numbers or FAQ’s on the topic. Molly: The first several years when we were all reading the same book, I had a list of discussion questions, and we also did arts and crafts projects from the Library as Incubator’s Book to Art Club website. We also would arrange to see a special screening of movies based on YA books at the local theater on occasion, and even took a field trip to RT Convention’s Teen Day events when it was held in Kansas City. Now that we’re a Teens’ Top Ten group, I start the meetings by letting them browse and select new books, then we all take turns talking about what we’ve read and what we’ve liked. In January, I’m going to start having book club meetings at the high schools over the lunch hour. What has been your favorite book you read for book club and why? Dawn: I’ll Give You the Sun has been the club favorite by far. A lot of my book clubbers are questioning their sexuality or have friends who are and this book really hit home for them. Sarah: The Lunar Chronicles by Marissa Meyer, Steelheart by Brandon Sanderson, Percy Jackson, a lot of dystopian. Jennifer: I missed out on reading The Call of the Wild by Jack London, when I was younger, so it was cool to read an older title for the first time with them (and I totally fell in love with the book). Getting them to read Howl’s Moving Castle was deeply satisfying. The book makes much more sense than the movie, and then we had a great discussion about film adaptations. Traci: My favorite book read for book group is Miss Peregrine’s Home for Peculiar Children by Ransom Riggs. My teens were so into that book – we spent at least 25 minutes talking about the time loop! With illustrations on the white board! Diana: The teens had a bunch to say about Shipbreaker by Paolo Bacigalupi and The Silence of Murder by Dandi Daley Mackall. I’d say that dystopian and thrillers have incited the most conversation from them. Emily: Favorites among our group have been Splintered by A.G. Howard, Unwind by Neal Shusterman, and Zac and Mia by A.J. Betts. Molly: Aristotle and Dante Discover the Secrets of the Universe by Benjamin Aliré Saenz was definitely a favorite of the group. One of the teens even said she loved reading about a loving Mexican-American family, and she related to the book so much because of it reminded her of her own family. This underscored for me how important it is to feature diverse books. The majority of my book club attendees are not white, so it makes zero sense to read books mostly about white characters. 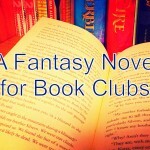 What do you hope teens gain from participating in book club? Dawn: We are trying to increase reading comprehension. I encourage them to take notes as they read. I’ll put fun post it notes in their book. I don’t ask summary questions; I ask comprehension questions about the relevance of the title, I’ll ask them to interpret quotes and state their relevance, I’ll ask questions about character motive. A lot of our clubbers are writers and I’ll point out why the author chose their POV and how it affects their story. I’ll point out how the author wrote their villain or teach them about unreliable characters. Jennifer: A chance to socialize with other readers and practice respecting others opinions and beliefs while discussing a variety of topics. I also hope that having a book selected for/recommended to them with no assignments attached to it encourages them to read for pleasure for the rest of their lives. Susan: Friendship, becoming a group by getting to know and respect each other. The ability to listen to each other and agree or disagree respectfully, to become aware of different genres and authors (a group of the teens went to Merrillville to see Mike Mullins after we did Ashfall), to be able to compare a book and a movie, to learn how to put together an event (jeopardy, for example), to enhance their love of reading and to write for the teen blog. Traci: I can see so many of my teens gaining social skills as well as the ability to discuss something with a more nuanced opinion. We’ve gotten way beyond the “I just didn’t like it” to in-depth discussions of character development, stereotypes, etc. Socialization is also a big one! Diana: We are within walking distance of a high school and fairly close to 2 junior highs. We have also had good turnout from local homeschool teens that like to socialize with other teens in the area. Our hope is to increase literacy and socialization by inciting conversation and as a secondary goal, to introduce them to books/materials they may not know about. Emily: A sense of belonging and a place to talk books and use books a catalyst to talk about bigger issues they may be dealing with. Molly: When we first started, they were voracious readers and were friends that went to different schools, so it was a way for them to socialize. Also, I was surprised by how much the book club more than other types of programs really developed closer relationships between not only the teens in the group, but between me as the facilitator and them as individuals. I’m really close to all the regulars, both as mentors and as friends, and I go to their school plays or judge debate for them, I listen to their relationship issues or drama with their families, I’ve written them recommendation letters for internships and read their own original writing. Talking about books quickly becomes talking about life. Are there any changes on the horizon for your book club? Dawn:Our club will participate in a Galley/Review program next year. Sarah: They’ve asked to meet twice a month after school. Jennifer: I have just started ordering books specifically for this group and being uncoupled from what exists in our catalogue has allowed me to select a newer and more diverse range of titles/authors. I am interested to see if more of the group actually reads the titles with the new selection and am super excited to add more graphic novels to our roster (we are reading Ms. Marvel: No Normal in a few months)! Diana: For my library, the main change will be the format and some of the structure. Originally, we went from only allowing 13-18 years old after school and providing discussion questions. We also purchased a small amount of non-cataloged books they could read and keep. Due to budgetary constraints, we could no longer provide free books. Since our older teen numbers were dwindling and we had junior high students requesting a book club, we have changed our age range from 6th-12th grade (we expect to get mostly 6th-9th grade). We are also providing snacks as enticement. We adjusted our meeting time to 15 minutes later to allow teens from across town to catch the bus and make it in time for the meeting. Finally, we are going from book specific meetings to genre specific meetings in order to allow new members to come and not feel intimidated by missing the previous month’s book. As the librarian, I will still highlight a “book of the month” that repeat teens could read, but we will still book talk the genre as a whole. Molly: Both because my core group of teens is getting ready to graduate and because after next year we’ll no longer be a Teens’ Top Ten group, I know my group will change. It’s hard for me to recruit new attendees. I’ve changed positions in the library, so I only work the desk two hours a week, and I don’t have as much chance to get to know new teens and invite them to the program (because personal invitations from me has been by far the most effective way to get new attendees). I’m excited to start visiting the schools. I handed out books during lunch before, but January will be my first time actually having a meeting in the rooms. Keeping track of who has borrowed books and getting them back when they end up not coming to meetings is a huge hassle, so if possible, I’d like to try featuring a genre each month and letting everyone pick their own book or just giving away books. 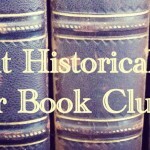 Have questions about any of the book clubs discussed? 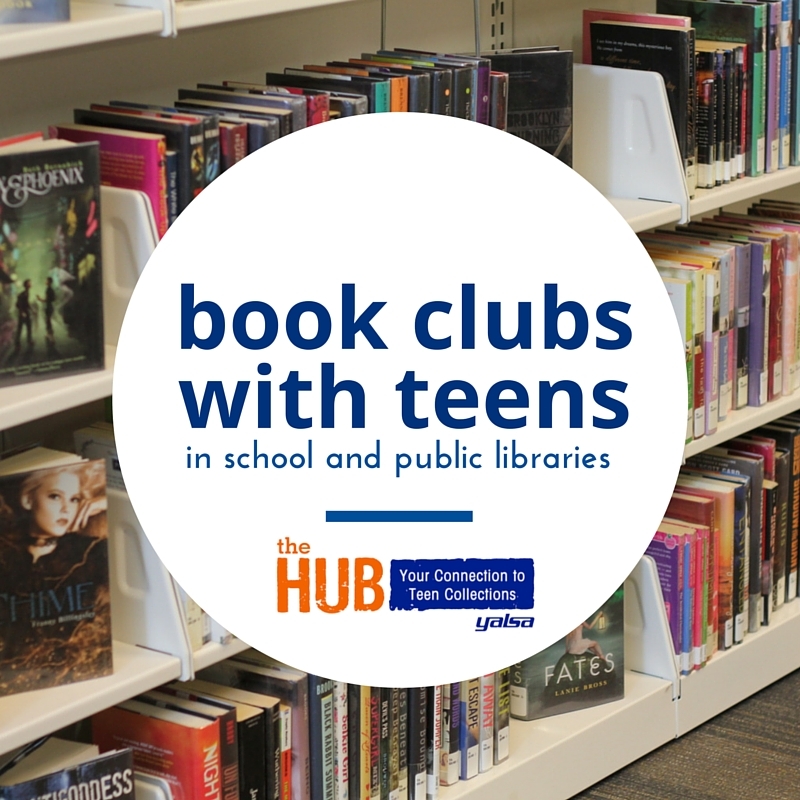 Want to share your own experiences with teen book clubs in your library? Please leave your comments below! Previous Post YALSA’s 2016 Morris/Nonfiction Reading Challenge Begins! This is a great post, I will definitely save it for further reference! I am a Book Club advisor, Middle Grade and High School. The “Founding Members” as they like to be called are either graduated or in High School now. I could say I have half Middle School and half High School. We started out in the right path, one book a month, but over the years it has been hard to keep the members committed. The club has become more of a social gathering, everybody reads different things. But, despite it all, I am able to have a first semester accomplishment: a Skype video conference with Adi Alsaid (Let’s Get Lost). So not bad. I hope I can find you all in Twitter to follow up on Library and Book Club ideas. I do MS and HS students as well. I don’t have HS students come to the club so well done you on keeping them attending. Maybe your older kids would like to help talk about read-a-likes the younger kids haven’t thought of? Or maybe help talk about assigned school readings if they already read them (I know that’s not as much fun, but it could get them talking about the same thing or advising on how to comprehend the whole book). That’s a great idea, thank you so much! I need fresh ideas for the New Year! !